Why would you want to consider Ayurvedic seasonal rejuvenation? What is it even? Ayurveda teaches us that we are Nature’s reflection. To maintain our personal balance, it is wise to pay close attention to the rhythms of Nature and make our choices accordingly. As life is full and our energy is constantly drawn outward, it is useful to slow down, pause and turn our attention inward. In my opinion, it is almost always a good time to rejuvenate. The ideal times for cleansing and rejuvenating, as taught in Ayurveda, are at the junction of the seasons. For some, full Panchakarma cleansing is indicated. For others, one or more days of rejuvenation treatments are beneficial. Once reserved for royalty in India, these luxurious treatments are now available to all. Each day consists of 2 1/2 hours of nurturing Ayurvedic treatments. You will begin by receiving either a 1 or 2 person abhyanga, with warm herbal oil that will leave your skin smooth for days. 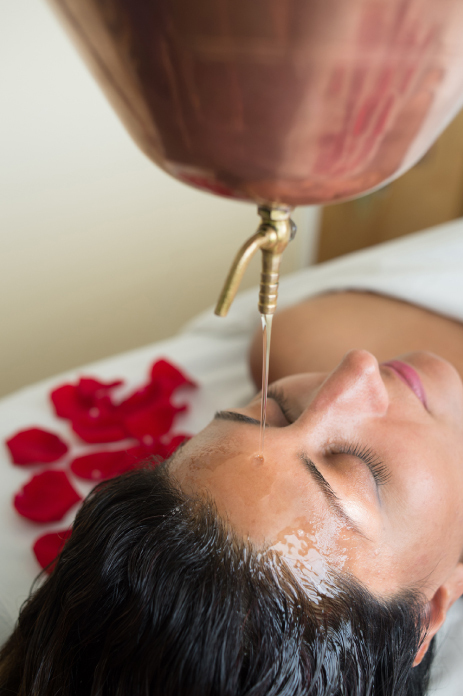 Following this is the aromatherapy steam treatment (svedana) to open your pores, detoxify the channels and further enhance the benefits of abhyanga. Next comes a guided chakra balancing session to restore flow of energy along the midline and whole body. Finally you dissolve into a deeply relaxing shirodhara, where warm oil pours in a steady stream over your forehead, inducing a bliss state. Treat yourself and be nourished! You are welcome to come in for a single Day of Ayurvedic Rejuvenation or a customized 3-Day Rejuvenation Package – In-City Retreat. The Day of Ayurvedic Rejuvenation is 2 ½ hours of tandem Abhyanga, Aromatherapy Steam Treatment, Chakra Balancing and Shirodhara. When you schedule 3 days or more, I will be happy to offer you a complimentary 15-30 minute phone call to support you with additional self-care and rejuvenation tips. *** Please schedule in advance to secure the dates you wish for.